We at Flim Springfield have been offline for a while, and as 2018 FINALLY begins there’s time at last to explain why. A few months back, Ms. Flim Springfield got her dream job, working as a mechanic in the cutting edge electric vehicle industry, which involved moving to California! Hollywoo, Tinseltown, La-La-Land. The City of Illusions. Here’ a hint about the company she works for. During this period JRC was still living in Phoenix, working hard to wrap up a handful of non-Simpsons projects. There just wasn’t much time or energy available to work on the blog. 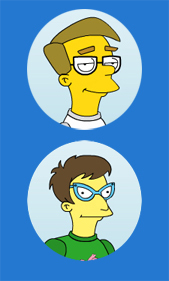 But that doesn’t mean we weren’t working on other Simpsons stuff. 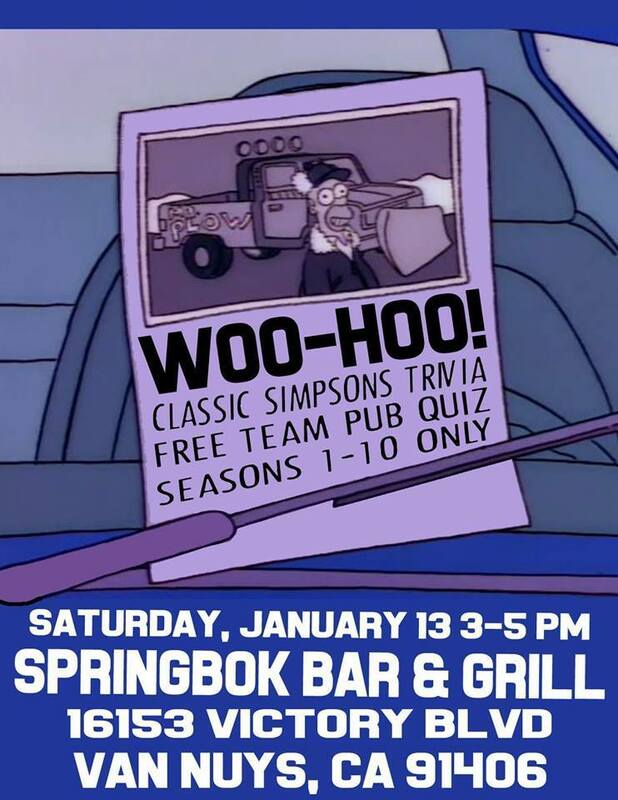 Our Springbok show is different in that it takes place on Saturday afternoon, and has a different setup system for the questions, 4 categories of 10 questions each, instead of our 35 questions and 8 categories. There’s also a projection screen so we can have the questions/answers on screen and other stuff. We’re still working the bugs out of the system, but it was a fun way to make my debut in LA. We’ve got a Facebook community page to meet teammates and trade memes, and our next show is Saturday January 13th at 3pm, we hope you’ll come give us a try. We’re living in a suburb where there happens to be a lot of animation production. Cartoon Network, Warner Brothers, and Nickelodeon are all nearby. One morning for breakfast we went to Moore’s Delicatessen, which in addition to having great coffee and sandwiches is also a regular lunch stop for folks working in the industry, their back room is covered with sketches by the people who create your favorite cartoons! Aside from these adventures, I’ve pretty much spent my time trying to get adjusted to life here and integrate myself into the town. I got my library card, driver’s license, found a new local comics shop, visited some of the neat local shops, and the nearby museum complex . . .
Name one successful person who ever lived without air conditioning!? 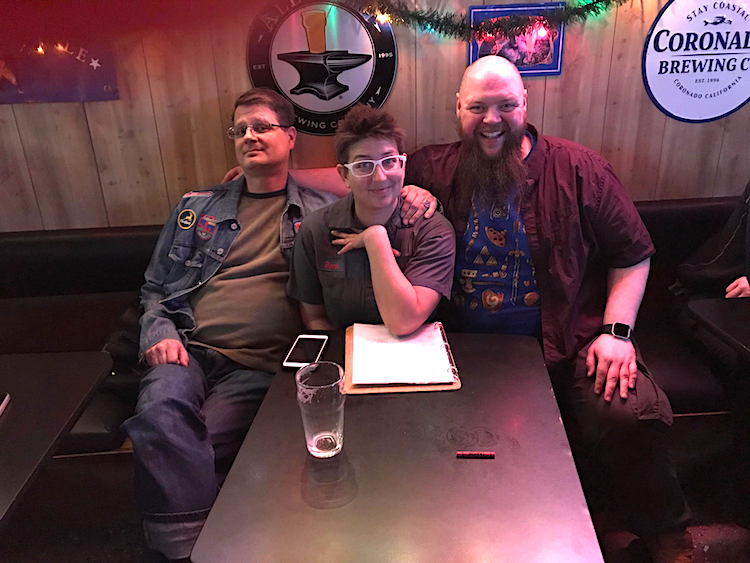 To cap things off and kickoff the new year, Diana and I got to meet in person one of our Simpsons Community peers from down under, Elliot Jay O’Neill from Australia’s The Simpsons Index spreadsheet and podcast! Did someone say long lost triplets? Los Angeles seems to have a lot to offer, and I’m looking forward to exploring it for a long time. Who knows what adventures we’ll have! This entry was posted in Classic Simpsons, coming soon, Contemporary, live show, podcasts, The Simpsons, trivia and tagged california, Hollywoo, hollywood, los angeles, robot cars. Bookmark the permalink.